Simon Peter, Thomas (called “Twin”), Nathanael from Cana of Galilee, Zebedee’s sons, and two others of His disciples were together. “I’m going fishing,” Simon Peter said to them. “We’re coming with you,” they told him. They went out and got into the boat, but that night they caught nothing. When daybreak came, Jesus stood on the shore. However, the disciples did not know it was Jesus. 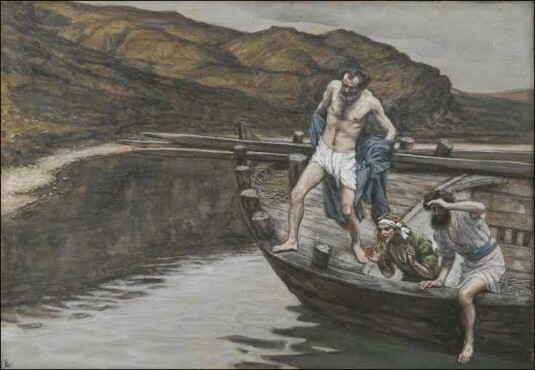 “Men,” Jesus called to them, “you don’t have any fish, do you?” “No,” they answered. This is Jesus, revealing Himself. By doing what they had tried all night to do but couldn’t. By giving them more than they could hold. That’s how John knew it was Him. And so I wonder. How has Jesus revealed Himself to you? What has He done in your life that you tried to do, but couldn’t? What are the blessings He has given that are more than you expected? How did you know it was Jesus? I tried to fix my marriage. Many times, in many ways. Just couldn’t do it. Jesus revealed Himself through a restoration that went beyond any prayer I had prayed. I tried to reach my prodigal daughter, to get her to run back to her Father. She remained a prodigal. Until Jesus revealed Himself by pursuing her heart right back to Him. Healing I couldn’t get for myself. Strength I just didn’t have. Hope I couldn’t find. Peace in the middle of battle. Doing what I tried, but couldn’t do. Giving more than I could hold, more than I expected. This is how I’ve known it was Him. Today I am reminded of the many times and many ways that Jesus has revealed Himself in my life. And remembering brings an ache that is so good for my soul. The overwhelming desire to run to Him. To touch Him at last. This week, consider the ways Jesus has revealed Himself to you. Your soul will thank you.